Here are the men from the Filmfare Glamour and Style Awards and we want to know, who caught your eye? P.S. Ayushmann is wearing Amit Aggarwal, Vicky is in Gaurav Gupta, Shahid is in a Trill coat and Primaczar pants, Vikrant in a MintBlush suit. Diljit is wearing a Kanye West KSG sweatshirt. Spotted Ishaan, Tiger and Sushanth doing black in different ways at the Star Screen Awards. While Ishaan (in Anuj Madaan) and Tiger fared well, can’t say the same about Sushanth’s (inKunal Rawal) look. It felt too casual for the event in question. 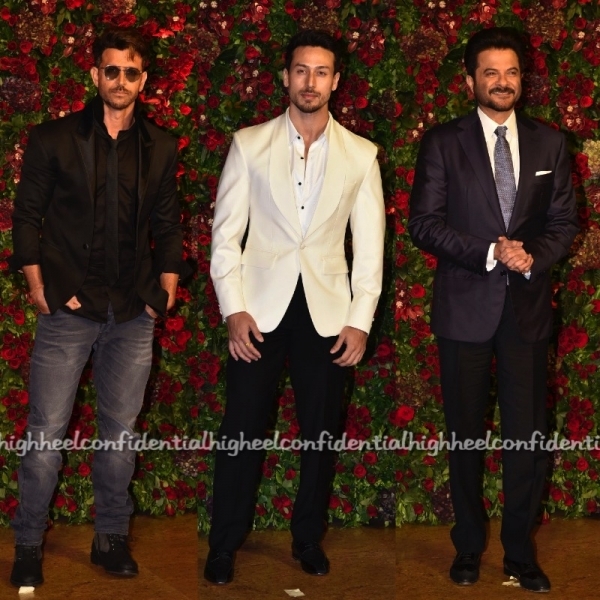 Here’s a dekko at the Bollywood men who attended the Deepika & Ranveer wedding Reception. A lot of them stuck to black but we had a few outliers. Tell us, whose look was your most favorite & whose look did you like the least? Hrithik was easily the least favorite look for us. Those denims with the unbuttoned shirt, the glasses at an evening event just did not cut it. Here’s a round up of a few Bollywood actors who attended the Lux Golden Rose Awards. I have to say that Karthik Aryan in Hugo boss was my favorite of the lot. What about you guys? Got a favorite? Spotted Ishaan Khatter (in Sahil Aneja), Rana Daggubati and Varun Mitra doing different shades of Grey at the Vogue Beauty Awards 2018. I liked Varun’s look the most of all the three. What about you guys, which one do you prefer?